I must say I feel lucky to have Mr. Denning(leaning on the cop cruiser) as my instructor, can't wait until we fly again. Hopefully soon and get that first dual cross country done! Well here it is enjoy!! 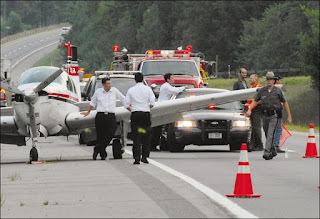 "The plane (C-GSCZ) was gliding only 15 metres above two transport trucks before Mr. Denning brought the plane down safely on Interstate 87, close to the town of North Hudson, near Lake Placid." Firemen and state troopers were able to move the aircraft off one lane, allowing traffic to flow past the disabled plane. "They just pushed it off to one side," Bessey said. As they waited for NTSB officials, the pilot and passengers leaned against the side of the plane, Bessey said. "They were chuckling, everybody was chuckling with them. His instruments told him he was 15 minutes from Burlington. He said at least he got to see Vermont. We told him he wasn't in Vermont."